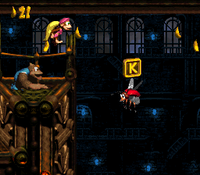 Fire-Ball Frenzy is the sixteenth level in Donkey Kong Country 3: Dixie Kong's Double Trouble!, and the first area of World 4, Mekanos. Karbines are all over this factory, shooting fireballs in the Kongs' path. In addition to them, the Kongs must be cautious of the vats of molten lava that lie around the level. Squitter appears in a bonus area, but he can't progress through the main level. Bristles, Knick-Knacks and Buzzes can be found here. The first item after the Star Barrel is a DK Barrel. Going east, the Kongs can find an invisible Bear Coin, but to do so, they must avoid a Karbine while going down five platforms and a pit of lava. Going east, they must avoid two Buzzes and two Karbines then go up a moving platform avoiding more Karbines. They must then avoid two Karbines shooting three fireballs to find the letter N. After that, the apes will go up a platform and find another DK Barrel. Koin is near here. They must go west avoiding eight fast shooting Karbines. These Karbines will again chase them on a high-up rope. Past here they will find another Bristle and the letter G. There will be four more Karbines before the level ends. Right after the letter N, the Kongs will find Koin next to a Steel Keg and Karbine. Koin uses the DK Coin as a shield and does not want to let the Kongs have it. The Kongs must throw the keg against a nearby wall while on top of the Kremling to allow the apes to obtain the DK Coin. K: Hovering above a lone Knik-Knak. O: Shortly after the first Buzz. N: After the Karbine that shoots three times in a row. G: Right after a rope climbing section, hard to miss. 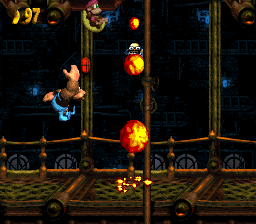 Right after the midway point, the Kongs will get chased by a Karbine down some platforms. If they choose to go left instead of right, they must avoid three Karbines while using Dixie's Helicopter Spin to avoid three vats of lava. In this area, they get to play as Squitter. They have to defeat several Buzzes while avoiding Karbines. There is a Bonus Coin at the end. There is a Karbine shooting three fireballs in a row. If the player looks above and to the left, they will see a banana. Dixie can be thrown up to this banana, then she will land on a platform. Go right to the Grab 15 Bananas! Bonus Barrel. The large moving platform with two Karbines above it is actually two small platforms layered over each other. This page was last edited on April 10, 2019, at 13:28.